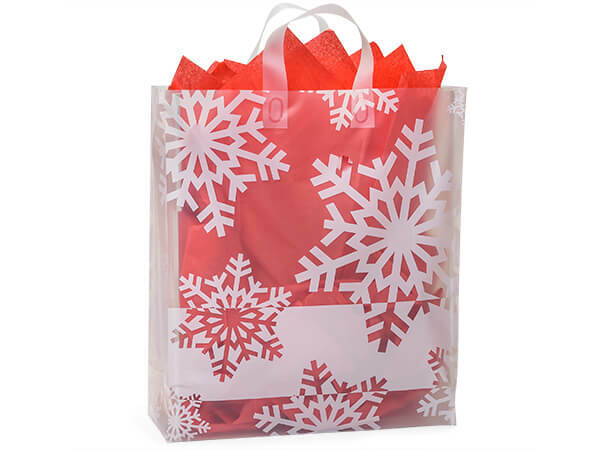 Our Snowflake Plastic Gift Bags are made from 4 mil frosted hi-density polyethylene. Design features large white snowflakes falling on a large bold stripe. These bags have 6 mil soft loop handles and heavy cardboard inserts. These bags are free standing and superior quality! Shop Nashville Wraps for exclusive Christmas Gift Bags for holiday gift wrapping!